The presence of our friendly ground staff ensured that most issues raised were resolved immediately. Sound planning in advance kept disruption to a minimum for rail passengers during a major line closure. Flood prevention work required a planned closure of the railway between Oxford and Didcot Parkway for two weeks in August 2016. Rail replacement operations were complicated by two further closures for part of this time: between Oxford and Banbury for resignalling work, and between Oxford and Hanborough for bridge repairs. The disruption made it a challenging period for operators and customers. Rail replacement for Great Western Railway and Cross Country Trains would require 34 services passing through Oxford and Didcot every hour during the morning and evening peak times. But both stations had limited space for buses. To complicate things further, two major public events in the area – a BBC Countryfile Live weekend and the Wilderness Festival – were scheduled for the same period. This seemed likely to create significant extra traffic and disrupt the rail replacement services. At Didcot station, we worked closely with stakeholders to reorganise traffic, allowing access for buses and coaches and overnight parking. Oxford proved more difficult. A nearby long stay car park was identified as a likely spot for rail replacement services, but its narrow entrance and adverse cambers could have damaged coaches. We suggested a solution that involved relocating barriers and removing kerbs, and made it happen by liaising with landowners and the local council. We provided buses and coaches during the fortnight – 112 vehicles a day. Our drivers were provided with a training guide. We also trained coordinators to work at key stations, where they would guide customers and exercise flexibility over ticket restrictions during the works. 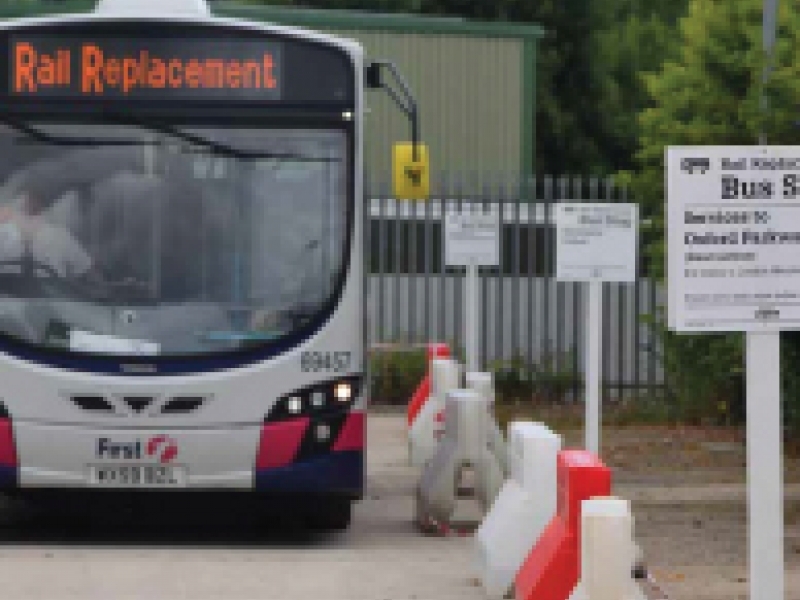 During the Countryside Live event, which drew over 125,000 visitors, we worked closely with Oxfordshire County Council to create a network of diversionary routes, reducing the disruption to rail replacement services. And during the Wilderness Festival the following weekend, we operated a regular shuttle service between Swindon station and the venue – taking the strain off the already busy Oxford and Didcot stations. The planning paid off: customer feedback during the work was positive. The presence of our friendly ground staff ensured that most issues raised were resolved immediately.